How long have you been in the United States? Since ’65. Did you go to work for Ames right away? Yes. It was part of Miles Labs. I had gotten to know the former Miles management, which at that time was made of primarily by the former owners, the families who started Miles Labs. Miles Labs became a public company, I think in the late ’50s. But when I joined them quite a few of its officers were family members. I met them in Switzerland, and they made me an offer that I couldn’t refuse to start the instrument program for Miles. And that was within the Ames Division, which was called the professional products division. Anton H. Clemens (right) was the inventor of the first blood glucose meter while he was the director of the Ames Instrument R&D Department of the Ames Division of Miles Laboratories Inc. in Elkhart, Indiana. 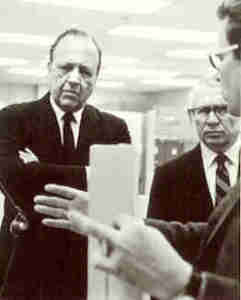 Here he is shown talking to George W. Orr, Jr., Group Vice President, Professional Products Group (left) and Walter Ames Compton, M.D., President and Chief Executive Officer of Miles Laboratories Inc. (center). This photograph appeared in the 1969 Annual Report of Miles Laboratories Inc., page 21. When was that? I think we had the first prototypes done around ’68. There was the new products development committee, which was made up of several different marketing, from finance, manufacturing, and R&D. I had proposed this as a product because I very strongly believed that from an engineering viewpoint it doesn’t make any sense whatsoever to take a blood sample to a lab and then have an answer at best in 3-4 hours after and then make any judgment on the diabetes management on the basis of that. I said that if so if it has any merit it should be done on the spot and at the site of the individual and therefore should also be battery operated. One of the higher ups in project management, in fact the highest up, said, “No. If at all it should not be battery operated, it should be line operated.” So after we had the first Reflectance Meter on the market…I think it came to the market in ’71. Then they took the device to Japan and had a Japanese company make a line operated one, the so-called Eyetone, which was a big flop, and everything went back to battery operated. The most effective person in marketing to recognize this right away was Charlie Suther. Charlie Suther was the only one initially to side with it. Now, at that time, Dextrostix sales worldwide were just a little more than half a million dollars. Sales not profit. $600,000. She agreed with the wager, which was a bottle of champagne. I won the bet but I never got the bottle. She and her husband invented the Dextrostix? Actually, that’s not true. The one who invested Dextrostix was a man by the name of Ernie Adams [Ernest C. Adams]. Ernie Adams worked for Helen Free. The Ames Division was started to become a diagnostics product line and was given the name Ames, because Ames was the middle name of the then president of Miles, Walter Ames Compton. He was a member of one of the founding families of Miles Labs. Walter Compton was an M.D., and during his internship became fully aware of the Benedict’s solution to test for urine sugar, in which the urine had to be cooked. It must have been a very messy procedure. And since he was fully aware of the effervescent technology of Miles Labs — Alka-Seltzer — and in this effervescent process heat also develops, so he had the idea, but also had the wherewithal within the organization to develop a urine test based on tablets. The Glucotest. So Ames had become conditioned to having urine tests that were based upon the tablet format. And it was Ernie Adams who came up with the idea of putting them on sticks, because it was so much easier to handle. And then when had a few more tests developed in the stick format, Ames then asked him, “Ernie, can’t you put it in the tablet format?” But Ernie Adams never got credit for what he did within the Ames organization or in the field in general. Ernie was a very bright individual but was a very shy man and very poor communicator. Is he still living? I don’t know. Ernie would have to be in the late 70s. Now, the Frees were the cheerleaders out at the medical conventions. So they got a lot of credit for stuff that was developed within Ames because those who did the development hardly ever took part in those conventions. So those who talked about it got the credit for it. Later on within Ames we developed for that time at least a very sophisticated small bench top unit, the urinalysis system. It had a footprint of 4 square feet and was about a foot and one-half high. It processed about a dozen tests and two samples per minute with automatic calibration, the whole bit. It was way ahead of its time. There was ongoing friction primarily between the Ames Instrument R&D Department, which I was heading, and Ames Marketing, because they would typically want to have a new product after Boehringer had theirs on the market. So reacting but not proacting. Ames did not really capitalize on their pioneer position and allowed Boehringer Mannheim to make big inroads. But then Walter Compton decided that in order to get the best out of both worlds more or less, he decided to have a new business unit, which was structured as a profit and loss center. However, the prime purpose of it was to develop products for life science research with the intent of in so doing that one should then be able to come up with advanced designs and idea that would filter into clinical medicine. Then I was in charge of that unit. In order to facilitate the interaction between the development of instruments and reagents to achieve good ‘systems’ performance I was, at that time (Ames) Director of Instrument R&D and Associate Director of (Ames) Reagent R&D. And then out of this, out of Life Science Instruments, that was the name of it, we then put together the first prototype of what eventually became a commercial artificial pancreas, the so-called Biostator® GCIIS (Glucose Controlled Insulin Infusion System). When we had the first production prototype ready, FDA came down with device legislation, and although we had a legitimate order from Washington University in St. Louis to place one, our corporate lawyers didn’t feel that this was right. They wanted to live up to the spirit of the law and in the process it cost us 4-5 years. In order to make this program survived we then established an assembly unit in Germany and we assembled about 200 units in Germany for distribution throughout the entire world. That changed more than anything the understanding of glucose control with the visible results that from thereon type 1 diabetics were treating themselves with multiple injections per day instead of one long acting insulin injection. I had 5 or 6 patents on the Biostator system. How many patents do you have altogether? In the U.S., about 30. I had about a dozen in Europe, before I came here. Are you a scientist or an engineer? I am an engineer. I have been in the medical field since ’51. I came to Ames in ’65. I left Ames and set up this different business unit within Miles Labs. My official retirement from Miles Labs was in ’87. Do you consider yourself retired now? I am a buyout retiree, but I will retire when I am 6 foot under. Was the meter called the A.R.M. or the Ames Reflectance Meter? Both. In trying to get a trademark established at the time, and it may have been because there wasn’t such a big push behind it, there wasn’t a big expectation, they did not go for a catchy name that would be a trademark in its own right, since Ames was trademarked they used the Ames name as a vehicle to trademark the A.R.M. When did you first start working on it? It was at my very first desk [at Ames]. That must have been during ’66. In ’68 the first prototype. But it didn’t come to market until about ’71? Charlie thought it was ’70. That’s possible. I have the patent here. “Patent issued in ’71.” I could go back, I may have some numbers in the files. But usually to have a patent issued a year after the introduction is not unusual. So it is likely that it was introduced in 1970. This was an early prototype of the Ames Reflectance Meter, made when they were considering the use of aluminum extrusion for the case to minimize the tooling cost. This case configuration was also used for the patent application filed on April 22, 1968. Photo courtesy of Anton H. (Tom) Clemens, the inventor of the Ames Reflectance Meter. If I had waited for approval of every product, we would still be waiting for the first product today.